Compact bench top three roll mill units for precise results. 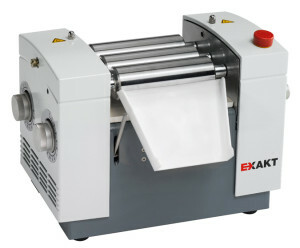 The EXAKT 50 I is now equipped with variable speed control. This gives the technician complete control over the shear in the gap. The lower the speed and/or the wider the gaps, the lower the shear. This may be particularly beneficial for formulations that react to milling by becoming too thick or too tacky under high shear conditions. For long term performance, solid aluminum oxide rollers are harder and more durable than solid porcelain rollers and, since aluminum oxide is less porous, cleaning is easier. For the serious compounder, these rollers will help to insure minimum particle fineness. The EXAKT 50 I has a new motor that delivers more torque than the 50 I. This dramatically helps performance in those formulations with high concentrations of actives and a high “tackiness” factor. Emergency stop and mechanical and electrical overload protection. 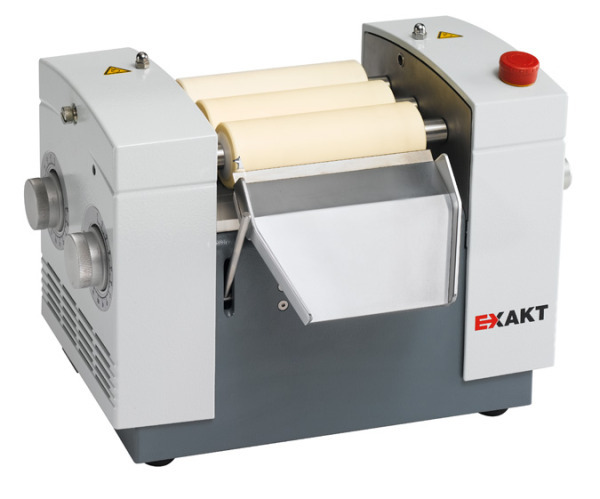 The EXAKT 50 I is the first small pharmacy mill with a top mounted emergency stop button. In addition, unlike other ointment mills from other companies, this mill and the classic mill include an internal mechanical switch to sense an overload and shut down the motor before any motor damage can be done. With the purchase of an extra set of rollers, you can increase efficiency by having a clean set ready for your next preparation. Unlike other ointment mills that have hollow rollers, our rollers are solid and can be submerged in water. The alignment of the gaps is maintained because the rollers remain in one solid unit when removed from the machine. 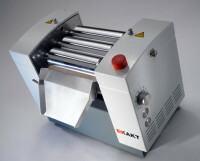 Removable rollers cut down on cleaning time and cross contamination between preparations. The single spindle scraper apron self-adjusts to the surface of the rollers. No more positioning on pins. And for better product removal, the tension of the scraper is adjustable on the front of the machine. This feature mounts securely under the rollers and is recessed to capture spills and/or overflows. New graduated dials give you a broader range of repeatable settings. EXAKT DataLog software – allows users to transmit operating parameters of the EXAKT E-Series via serial interface RS232 to a PC. 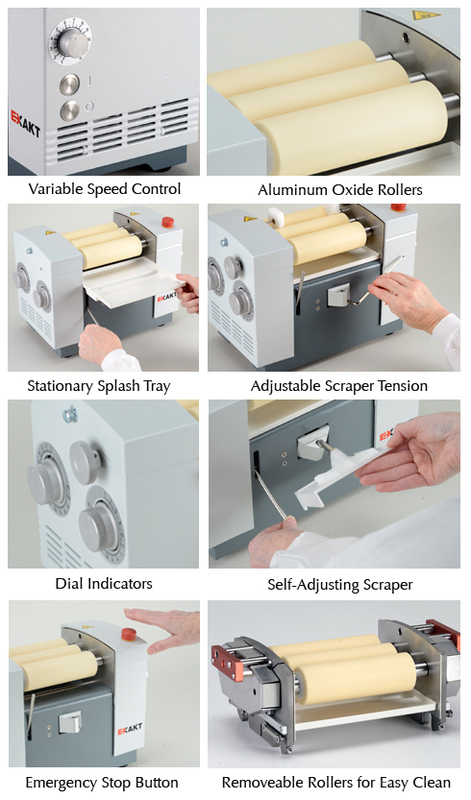 The innovative removable roller set is ideal for handling the wide variety of products. Multiple roller sets make work flexible and fast. Downtime when changing materials is avoided and the risk of cross-contamination reduced. The generously designed roller set makes cleaning convenient and easy. All surfaces in the processing area are made of stainless steel. The process is low-loss and clean.